Extruded Plastics are among the most commonly used plastics in day to day user applications. Extruded plastics are manufactured using extrusion process, in which raw plastic is melted to form continuous profile. The plastic products manufactured using extrusion process includes pipe/tubes, plastic films, plastic railings, thermoplastic coatings, and, window frames among others. The materials used in the plastic extrusion include polyethylene, polypropylene, polystyrene, and polyvinyl chloride among others. Owing to growing applications of plastic in the industries and end-consumer application the demand for extruded plastics is on the rise worldwide. Extruded plastics market is manufactured after melting and forming into a continuous profile. Extrusion produces items such as pipe/tubing, weather-stripping, fencing, deck railings, window frames, plastic films and sheeting, thermoplastic coatings and wire insulation. The global extruded plastics market is expected to be primarily driven by factors such as low feed stock and energy prices, growing demand for extruded plastics from the construction industry. 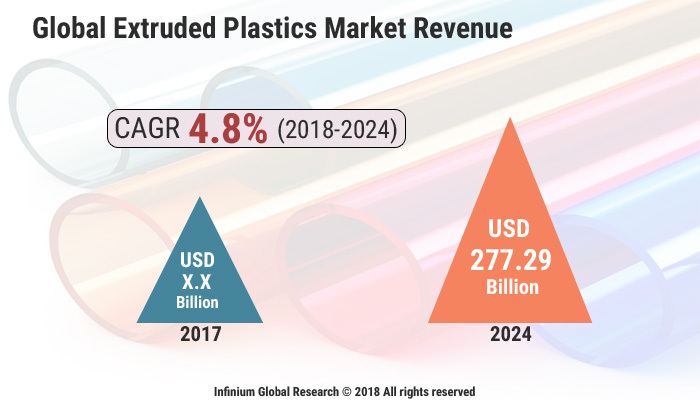 However, the growth in global extruded plastics market is likely to be restrained by factors such as lack of product differentiation and volatile crude oil prices. The global extruded plastics market was worth USD 191.30 billion in 2016 and it is projected to reach USD 277.29 billion in 2024 expanding at a CAGR of 4.8% between 2018 and 2024. In terms of volume of consumption the market size of extruded plastics was 294.6 million metric tons in 2016 and it is projected to reach 376.0 million metric tons by the end of 2024, growing at a CAGR of 3.1% over the forecast period 2018-2024. The global Extruded Plastics market is driven by the factors such as, growth in end user industries, growing per capita plastic consumption in emerging markets, and tremendous growth of market growth in SE Asian countries. However, volatile feedstock prices and tighter operating margins, stricter environmental norms and recycling of waste and passive sentiments over plastic consumption are likely to act as restraining factors affecting the global extruded plastics market over the forecast period. Asia-Pacific dominates the world extruded plastics market in terms of dollar share, while RoW (including South America and the Middle East) region is expected to grow at the highest CAGR over the forecast period followed by Europe. The growth in the Asia-Pacific region is primarily driven by emerging economies such as India, China, and Indonesia. The report on global extruded plastics market covers segments such as, type and end user. On the basis of type, the global extruded plastics market is categorized into low-density polyethylene, polypropylene, polyvinyl chloride, high-density polyethylene, polystyrene and others (including ABS, polyamides etc.). On the basis of end user the global extruded plastics market is categorized into packaging, building and constructions, automotive, consumer goods, electrical and electronics and others (workstations, exploration, and others). The report provides profiles of the companies in the global extruded plastics market such as, Formosa Plastics Group, SABIC (Saudi Arabia Basic Industries Corporation), Sigma Plastics Group, JM Eagle, Sealed Air Corporation, Berry Plastics Corporation, E. I. Du Pont De Nemours and Company, AEP Industries Inc., The DOW Chemical Company and Chevron Phillips Chemical Company LLC. The report provides deep insights on demand forecasts, market trends, and micro and macro indicators. In addition, this report provides insights on the factors that are driving and restraining the global extruded plastics market. Moreover, IGR-Growth Matrix analysis given in the report brings an insight on the investment areas that existing or new market players can consider. The report provides insights into the market using analytical tools such as Porter's five forces analysis and DRO analysis of extruded plastics market. Moreover, the study highlights current market trends and provides forecast from 2018-2024. We also have highlighted future trends in the extruded plastics market that will impact the demand during the forecast period. Moreover, the competitive analysis given in each regional market brings an insight on the market share of the leading players. This report will help manufacturers, suppliers and distributors of the extruded plastics market to understand the present and future trends in this market and formulate their strategies accordingly.